Guest Contributor in The Spotlight - Mike DiMatteo, Head Football Coach, Buffalo Grove H.S. Buffalo Grove, IL. Mike DiMatteo served as Managing Editor of Option Central for a period of time during what we've referred to as The 10 Years of Option Central. Coach DiMatteo also contributed to the Option Central Article Library, with his Formulating Formations article while he was Head Coach at Hinsdale Central, Hinsdale, MI and The Lake Zurich Outside Veer while Head Coach at Lake Zurich H.S., Lake Zurich, IL. With the recent resurgence of the Spread Gun and Pistol Option attacks, we were excited to learn that Coach DiMatteo had just published a series of videos with Coaches Choice. 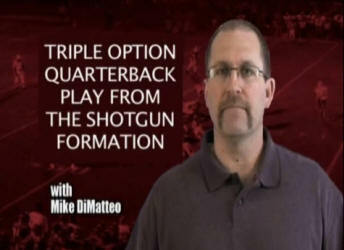 With the permission of Coaches Choice, we produced this preview video "cutup" to introduce his new Triple Option Quarterback Play from the Shotgun Formation video to our current Members and Visitors. Contact Us with your questions about the Guest Contributor program or to have a Guest Contributor Profile created.